Full of ideas about NWN:EE? - Share them on the Beamdog forums, vote on the Input board, and watch the progress of the game development on the Roadmap board! During today’s Twitch stream, Beamdog Studio CEO Trent Oster and Studio Director Phil Daigle shared recent news about Infinity Engine Enhanced Editions and plans for Neverwinter Nights: Enhanced Edition. They introduced the new trello system for NWN:EE, and played A Harper’s Tale - Prelude, a fan-made NWN module created by Dave Mason more than 10 years ago and runs perfectly in NWN:EE. The 2.5 update open beta for Baldur’s Gate: Enhanced Edition, Baldur’s Gate II: Enhanced Edition and Icewind Dale: Enhanced Edition is available on Google Play, Steam, and Beamdog. This patch is all about fixing Multiplayer, so we need a ton of Multiplayer feedback. Share your feedback in our Survey. If you can play the open beta on Android, connect to the PC version, spend time playing Multiplayer, and reflect on it in the survey - we’ll be very, very grateful. The open beta and survey will run over the holidays, through to January 8th, with the possibility of an extension. Try new features, like the Shaman class introduced into Icewind Dale: Enhanced Edition! After the 2.5 patch we plan to move Siege of Dragonspear to tablets. 2.5 needs to be as solid as can be so that SoD is an excellent experience for those trying it for the first time. We have a big sale going on currently for all our Infinity Engine titles on GOG, so check it out! If you still haven’t joined Neverwinter Nights: Enhanced Edition Head Start, do it now. By pre-ordering the game from Beamdog and participating in the Head Start, you can shape the future of NWN:EE. We now have a live Trello board for Neverwinter Nights: Enhanced Edition which we call the Roadmap board. The Roadmap board is a public read-only board where interested parties can inform themselves on what is going on in the NWN:EE land, development wise. You can find larger features and updates that we are considering, are in development, or are nearing completion. 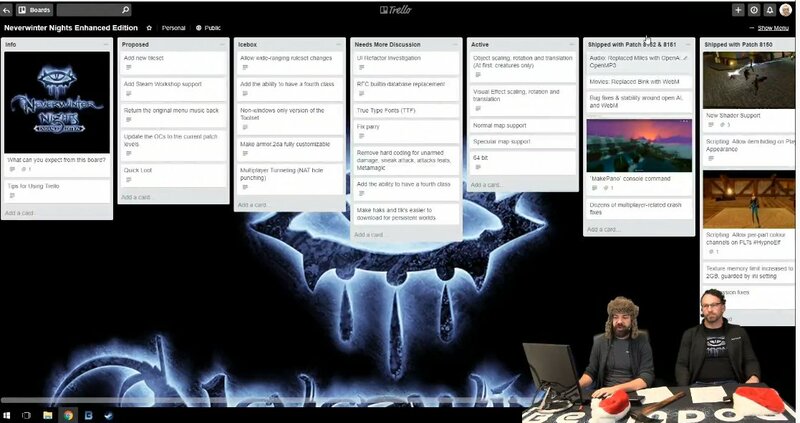 There’s also another live Trello board - the Input board. This board is something that will be filled with cards based on community feedback. Neverwinter Nights fans can vote to prioritise features and fixes. Once the development team is ready to investigate a feature request or are working to implement it, they will pick cards from the Input board and move them to the Roadmap board. To nominate a feature for the Input board, please, visit the Beamdog forums and share your ideas there. Key members of the community will then create a corresponding card on the Input board so fan can vote or subscribe to the feature. If you’re interested in helping us make Neverwinter Nights: Enhanced Edition better, go vote in the Input board and share the feedback on the Trello board discussion forum. There also will be separate threads for every card from the “Needs More Discussion List”, so that you could provide more details and feedback about how this or that feature should look like. We aim to be conservative in what we are putting on our Roadmap board, but there are no guarantees of features getting implemented. We sometimes even might stop working on a feature, move it to the Icebox or remove it from the Roadmap altogether. If you have a suggestion for a fan-made module you'd like to see played on the stream, let us know on Twitter, Facebook, or in the forums! We have no plans for the boxed version of Neverwinter Nights: Enhanced Edition as of yet. Right now we’re focused on making NWN:EE the best it can possibly be. Currently Neverwinter Nights: Enhanced Edition doesn’t support EAX. We’re rolling out OpenAL first. We’ll keep looking into bringing EAX to NWN:EE. We updated Neverwinter Nights: Enhanced Edition with the latest version of the C++ builder, and we will be very careful with the builder so that we don’t break stuff. We are open to expand the current Neverwinter Nights scripting, and updating it is not off the table. Go to the forum and create your requests, we need to know the details of what you would like to see. We’ve had a lot of discussions about a potential clash between old Neverwinter Nights assets and new assets we could create. A potential clash is why we are not revising the existing assets. But when we look at the new content we could do, we want it to become something to show the future we anticipate for Neverwinter Nights. The story of the official campaign of Neverwinter Nights has been told. What we would prefer to do is create new story content.